Pre-heat oven to 350’F. In a 9 ½ inch springform pan, place the crust ingredients ,and blend until combined well. Press mixture evenly over bottom and 3/4 inch up the side of the pan. In a large bowl with an electric mixer, beat the filling ingredients on high speed until light and fluffy (about 5 minutes). Pour the filling into crust, and bake in middle of oven 20 minutes, or until the cheesecake is just set in center. (Cake will continue to set as it cools.) Transfer the cake in pan to a rack and cool (about 3 hours). Place the juice in a 1 cup liquid measure, and add water. Sprinkle gelatin over the juice mixture, and let it stand for 1 minute to soften the gelatin. Transfer the gelatin mixture to a small saucepan. Add sugar, and cook over moderate heat, stirring, until sugar is dissolved. Pour the mixture into a bowl, and set the bowl in a larger bowl of ice and cold water, stirring the mixture gently until cold and slightly thickened but not set. 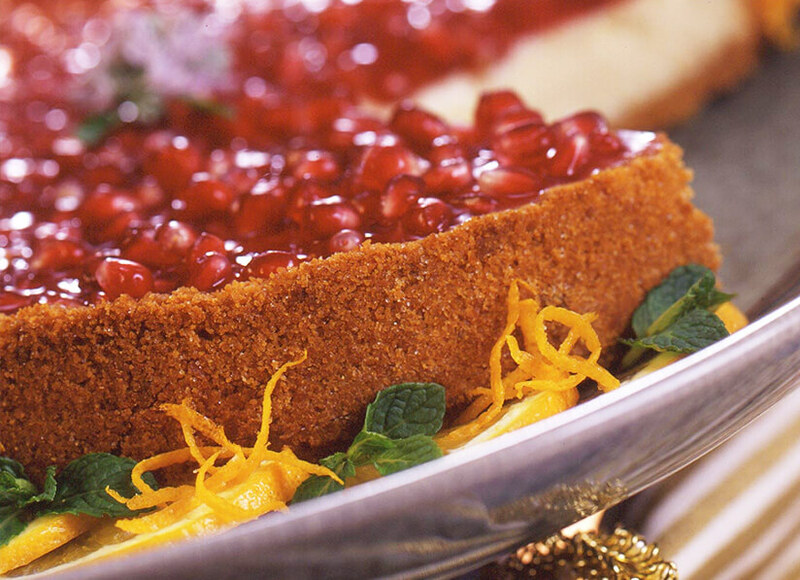 Stir in pomegranate seeds, and spoon the topping onto the chilled cheesecake. Chill the cake until the topping is set (about 1 hour). Remove the side of the pan, and serve chilled.